What to look for in a inspector? What could be wrong with my home? How much does a home inspection cost? We use state of the art equipment to test and analyze all gas appliances at the property. Carbon monoxide is produced by burning any fuel. Therefore, any fuel-burning appliance in your home is a potential CO source. When appliances are kept in good working condition, they produce little CO. Improperly operating appliances can produce fatal CO concentrations in your home. Likewise, using charcoal indoors or running a car in a garage can cause CO poisoning. Remember, if you have any of these symptoms and if you feel better when you go outside your home and the symptoms reappear once you're back inside, you may have CO poisoning. Make sure appliances are installed according to manufacturer's instructions and local building codes. Most appliances should be installed by professionals. Have the heating system (including chimneys and vents) inspected and serviced annually. Examine vents and chimney regularly for improper connections, visible rust or stains. Never service appliances without proper knowledge, skills, and tools. Never use the gas range or oven for heating. The U.S. Environmental Protection Agency suggests that if you suspect that you are experiencing carbon monoxide poisoning, get fresh air immediately. Open windows and doors for more ventilation, turn off any combustion appliances, and leave the house. You could lose consciousness and die from carbon monoxide poisoning if you do nothing. It is also important to contact a doctor IMMEDIATELY for a proper diagnosis. Remember to tell your doctor that you suspect carbon monoxide poisoning is causing your problems. Prompt medical attention is important. Proper attention and maintenance of combustion appliances in the home is most important in reducing the risk of carbon monoxide poisoning. A carbon monoxide alarm can provide added protection, but is no substitute for proper use and upkeep of potential carbon monoxide sources. No detector is 100% reliable, and some individuals may experience health problems at levels of carbon monoxide below the detection sensitivity of these devices. Combustion appliances are those which burn fuels for warmth, cooking, or decorative purposes. Typical fuels are gas, both natural and liquefied petroleum (LP); kerosene; oil; coal; and wood. Examples include space heaters, ranges, furnaces, fireplaces, water heaters, and clothes dryers. These appliances are usually safe. However, under certain conditions (see below), these appliances can release harmful or deadly combustion pollutants into the home (commonly called combustion spillage or backdrafting. In addition, unvented or improperly vented appliances can add large amounts of moisture to the air, potentially resulting in both biological growth, and damage to the house. Proper selection, installation, inspection, and maintenance of combustion appliances are extremely important. Providing good ventilation can also can reduce exposure to combustion pollutants. Read equipment's home owner manual and instructions. Make sure equipment receives regular professional inspection and maintenance. It is important that you understand how to properly operate combustion equipment in your homes, and that you follow the manufacturer's recommendations for maintaining the equipment. Have your combustion appliances and your chimney regularly inspected and maintained to reduce your exposure to pollutants. Appliances that are not working properly can release harmful and even fatal amounts of pollutants, especially carbon monoxide, into the living space. Take special precautions when operating unvented fuel-burning space heaters. Consider the potential indoor air pollution effects if you use an unvented kerosene or gas space heater. Follow the manufacturer's directions, especially instructions on the proper fuel and keeping the heater properly adjusted. A persistent yellow-tipped flame is generally an indicator of improper adjustment and increased pollutant emissions. While a space heater is in use, open a door from the room where the heater is located to the rest of the house and open a window slightly when installing unvented (or "vent-free") space or water heating appliances is in use. Unvented appliances leave all combustion products in the house. Even if incomplete combustion pollutants such as carbon monoxide (CO) are kept to a minimum, these appliances can generate large amounts of moisture which can create its own problems. Unvented heaters require special precautions. When replacing heating equipment, consider using only sealed-combustion, induced draft, or power-vented furnaces, boilers, and water heaters. Traditionally, combustion equipment relied on natural draft, the tendency for the warm combustion air to rise up a chimney. Today's more efficient equipment does not waste as much energy or send as much heat up the chimney, weakening natural draft. Natural draft can at times be overcome by conditions that depressurize the house, leading to spillage, backdrafting, and the problems associated with combustion products in the house. Most new equipment usually features sealed combustion or power-venting. The risk of backdrafting is lower with these types of equipment than for those relying on natural draft. Sealed combustion equipment draws its combustion air directly from outside the home. The combustion products are exhausted directly out of the home. The air intakes and exhaust are sealed off from the inside of the home, and this greatly reduces the change for any spillage of combustion products into the home. While induced draft and power-vented appliances rely on air in the home for combustion, they use a fan to force pollutants out of the home. This reduces the chance of natural draft being overcome be other fans or pressures in the home. Use a properly sized range hood fan if you use a gas range. All kitchens should have exhaust ventilation to remove odors and excess moisture associated with cooking. While there are various ventilation strategies for kitchens, a range hood is the most common. When using a gas range, a range hood directly vented to the outside should be used to capture the combustion products. These range hoods should be sized correctly. For a typical kitchen range the American Society of Heating, Refrigerating and Air-Conditioning Engineers (ASHRAE) and the Home Ventilation Institute (HVI) recommend 100 cfm. Larger fans may need to have makeup air provided to avoid excessively depressurizing the house, causing backdrafting or other problems. It is important that your installer conducts a worst-case depressurization test. This combustion safety test determines if any non-sealed combustion appliances will backdraft or spill combustion products into the living space. Tell your installer this test should use an established procedure such as Appendix D of the International Fuel and Gas Code or ASTM E1998 "Guide for Assessing Backdrafting and Spillage from Vented Combustion Appliances"
Always vent clothes dryers directly outside. In addition to combustion products produced by gas dryers, all dryers generate large amounts of moisture and particulates which should be vented out of the house before they have the opportunity to create problems. Make sure the device is certified to the most current Underwriters Laboratory (UL) standard 2034 (1998) or the International Approval Services (IAS) 6-96 (2nd Edition) standard. Install a CO alarm monitor in the hallway near every separate sleeping area. Be aware of all instructions and warnings associated with the CO Alarm. Too much moisture in a home can lead to mold, mildew, and other biological growth. This in turn can lead to a variety of health effects ranging from more common allergic reactions, to asthma attacks, and hypersensitivity pneumonitits, for example. Excess moisture can be in the form of high relative humidity including humidity generated by people and their activities such as showers, cooking, or drying clothes. Water can also come from plumbing leaks, wet boots, or splashing around sinks. Moisture can travel with infiltrating outdoor air (or exfiltrating indoor air) through the building shell, including the foundation. In addition to health problems, high relative humidity or water that enters building cavities that is not allowed to dry quickly can lead to problems such as rot, structural damage, and premature paint failure. Methods to control moisture include building an energy-efficient home with proper air-sealing, proper use of vapor barriers and vapor diffusion strategies. The entire building envelope, from the foundation to the roof, should be designed to not only prevent moisture entry, but also to allow any moisture which does enter a means to escape. As mentioned above, people and their activities in a home are big sources of moisture; thus proper ventilation is also important in order to maintain indoor humidity levels within an acceptable range. The ground around the home's foundation should be graded to slope down and away from the house at a rate of 1/2" to 1" per linear foot to drain surface water away from the house. Water from down spouts should be directed away from the house, discharging at least a few feet from the foundation. Test any underground drains with a hose to make sure they are working properly. Drains that are not working should be repaired or replaced with an elbow discharge described above. Be sure that driveways, sidewalks, and patios slope down and away from foundation walls at 1/4" per linear foot. In extreme cases, you may have to dig out around the foundation and replace the fill with an exterior drain tile and with a good draining material such a clean gravel. Because this can be very expensive in existing homes, you should get a few opinions as to whether this is necessary. In some areas, there may not be enough room outside the dwelling to provide proper drainage - in these cases, it is often recommended that interior drain tile and a sump pump be installed to remove water from basements and crawlspaces. This also can be very expensive. If the basement or crawl space has a dirt floor, cover it with 6 mil poly, overlapping edges by at least 12 inches. Seal any cracks or joints in the foundation wall or slab with an elastomeric caulk. 3. Use construction techniques to control water, air movement, vapor diffusion, and condensation. Use construction methods and materials which promote the drying of building assemblies. Use construction techniques which reduce the likelihood that warm, moist air will come in contact with cold surfaces, leading to condensation, mold growth, and rot. This includes controlling air movement and using vapor barriers on the warm side of walls and roofs. Proper flashing and drainage techniques should be used to keep rainwater out. There are different strategies to achieve this, and the strategies vary widely depending on the climate. For a good discussion of the approaches, consult a building manual such as the Energy Efficient Building Association's (EEBA) Builders Guide for your climate. High relative humidity (RH) can lead to problems with mold, dust mites, and other biological pollutants. Using exhaust fans in the bathrooms and kitchen can remove much of the moisture that builds up from everyday activities and help to keep RH below 50%. There are exhaust fans on the market that produce little noise, an important consideration for some people. Another benefit to using kitchen and bathroom exhaust fans is that they can also exhaust odors and pollutants from these rooms. These fans can be part of an active ventilation system for the entire house, and help to reduce humidity levels. 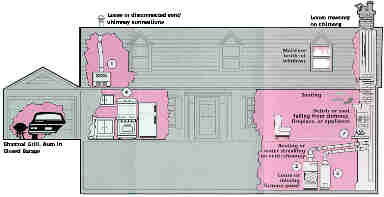 Vent bathroom, kitchen, and clothes dryer/laundry room exhausts directly to the outside, not into an attic or other enclosed space. 6. Size Air-Conditioning Equipment correctly. More is not always better. Incorrectly sized equipment can lead to operational and cost problems. Oversized air conditioning systems can "short-cycle" leading to rapid cooling without reducing indoor humidity levels. This can lead to a variety of problems associated with high relative humidity. Heat gain and heat loss should be determined for each house. The Air Conditioning Contractors Association (ACCA) provides a recognized standard procedure in the publication, Manual J. Equipment should be sized for each individual house because even identically built homes will be affected by variations such as solar orientation and shading which affect heating and cooling loads. Correct refrigerant charge (not under- or over-charged) and proper maintenance are also necessary for optimum performance of air conditioners. Below 30 percent relative humidity, people can be uncomfortable and can suffer from dry mucus membranes which can lead to nosebleeds and infections. In general, low relative humidity is only a problem during the winter months, when the outside air contains very little moisture. It is this dry outside air entering the home through cracks and openings in the building shell that causes the inside air to become dry. The greater the amount of outside air which leaks into the house, the dryer the indoor air becomes. By air-sealing and using energy-efficient construction, uncontrolled air leakage is greatly reduced, a more controlled indoor environment is created, and moisture can be maintained at acceptable levels without the use of a humidifier. Humidifiers require maintenance to avoid becoming breeding grounds for bacteria and molds. Install a CO detector and alarm that meets the requirements of the current UL standard 2034 or the requirements of the IAS 6-96 standard. A carbon monoxide detector/alarm can provide added protection, but is no substitute for proper use and upkeep of appliances that can produce CO. Install a CO detector/alarm in the hallway near every separate sleeping area of the home. Make sure the detector cannot be covered up by furniture or draperies. Do not use gasoline-powered tools and engines indoors. If use is unavoidable, ensure that adequate ventilation is available and whenever possible place engine unit to exhaust outdoors. On September 15, 1993, Chicago, Illinois became one of the first cities in the nation to adopt an ordinance requiring, effective October 1, 1994, the installation of CO detectors/alarms in all new single-family homes and in existing single-family residences that have new oil or gas furnaces. Several other cities also require CO detectors/alarms in apartment buildings and single-family dwellings. Carbon Monoxide Detectors are widely available in stores and you may want to consider buying one as a back-up --BUT NOT AS A REPLACEMENT for proper use and maintenance of your fuel-burning appliances. However, it is important for you to know that the technology of CO detectors is still developing, that there are several types on the market, and that they are not generally considered to be as reliable as the smoke detectors found in homes today. Some CO detectors have been laboratory-tested, and their performance varied. Some performed well, others failed to alarm even at very high CO levels, and still others alarmed even at very low levels that don’t pose any immediate health risk. And unlike a smoke detector, where you can easily confirm the cause of the alarm, CO is invisible and odorless, so its harder to tell if an alarm is false or a real emergency. First, don’t let buying a CO detector fool you into a false sense of security. Preventing CO from becoming a problem in your home is better than relying on an alarm. Follow the checklist of DOs and DON’Ts. Second, if you shop for a CO detector, do some research on features and don’t select solely on the basis of cost. Non-governmental organizations such as Consumers Union (publisher of Consumer Reports), the American Gas Association, and Underwriters Laboratories (UL) can help you make an informed decision. 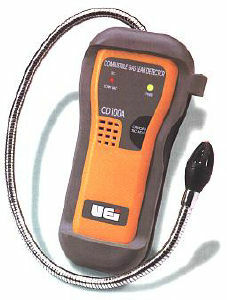 Look for UL certification on any detector you purchase. Carefully follow manufacturers instructions for its placement, use, and maintenance. Make sure it is your CO detector and not your smoke detector. The information provided on this page is based upon the CPSC and EPA's current scientific and technical understanding of the issues presented. Following the advice given will not necessarily provide complete protection in all situations or against all health hazards that may be caused by indoor air pollution and other indoor environmental contaminants. Mention of any trade names or commercial products does not constitute CPSC or EPA endorsement or recommendation for use.